The 2016 Presidential Election & Health Law and Policy: What Happens Now? As we look to the start of a new year, we cannot help but feel proud for what we have been able to accomplish with our many partners in this work. Together we have made important strides towards improving access to high-quality and affordable health care for underserved populations, particularly people living with HIV, HCV, and other chronic illnesses and disabilities.While the incoming President and Congress have indicated that they will seek to dismantle some of these gains, CHLPI remains committed to protecting the advances made over the past eight years. 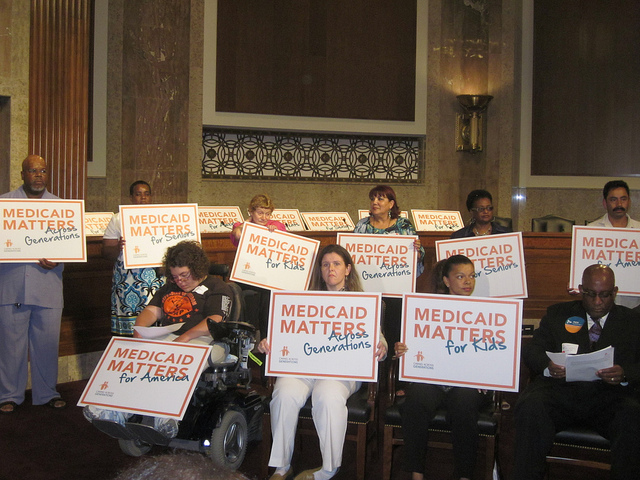 Defending Medicaid as the primary provider of comprehensive health care to low-income, at-risk populations. Continuing the process of ensuring that private health insurance works for people living with HIV and other chronic illnesses by reducing discriminatory insurance coverage practices and defending subsidies to low-income people. Promoting the ongoing importance of discretionary health programs, such as the Ryan White program and Title X. Ensuring anti-discrimination laws remain in place to protect health care rights. In our unique position as lawyers who advocate for legal, regulatory, and policy reforms to improve the health of all vulnerable individuals and communities, we are ramping up our capacity to influence the new Administration and work with Congressional leaders in both parties. As we have done for more than 25 years, we will continue working to educate all government officials in an effort to promote health care rights, reduce health disparities, and ensure that any reform proposals address the health and treatment needs of the most vulnerable. We will hold insurance regulators accountable for monitoring and enforcing the health care rights of all Americans. When necessary, we will continue to litigate against discriminatory public and private health insurance practices. Looking toward 2017, we know there will be challenges to health care rights and access. But many of us have been through previous times of challenge and can remember what it took to get this far, and every day new voices are added to the chorus demanding equality. As advocates for health care, we all know how to raise awareness, mobilize the public, and move the dial forward. Let us continue to work together to improve the health of all underserved populations. Sign up to receive updates from Health Care in Motion, our regular digest of updates, action alerts, policy development analysis, white papers, and advocacy tools addressing the changing health care policy landscape. The Harvard Law School Food Law and Policy Clinic (FLPC) is thrilled to share that the USDA has updated its guidance for food manufacturers and retailers, encouraging them to use a “Best if Used By” date label for their products. According to a national survey published by FLPC, the National Consumers League, and the John Hopkins Center for a Livable Future “best if used by”, is the phrase most easily understood by consumers as an indicator of quality. Using one standard label on all products, and clarifying that this label is intended to communicate quality can reduce consumer confusion regarding date labels. FLPC has actively been working to increase awareness about the policy changes needed to reform the expiration date system and decrease food waste for the past few years. In 2013 FLPC published a major policy report with the Natural Resources Defense Council that examines the legal and policy regime surrounding expiration dates on foods, and how unclear and unregulated date labeling on food contributes to an alarming amount of unnecessary food waste. On February 11, 2015, FLPC in collaboration with Racing Horse Productions released a short film, Expired? Food Waste in America, which profiles the waste of milk in Montana to illustrate the issue of misleading food labels as a leading cause of food waste in America and calls for a unified labeling system as a solution. FLPC has also worked with members of Congress on legislation to reform the expiration date system (the Food Date Labeling Act of 2016), as well as providing presentations and policy analysis to advocates, government agencies and food industry leaders that are working to reform the expiration date system through voluntary initiatives. FLPC applauds the USDA for moving to help reduce food waste and clear up confusion around expiration labels. The USDA revised guidance on date labeling is a great first step for standardizing expiration dates across the entire food supply. Read the full press release on the guidance. Learn about “Reduce and Recover: Save Food for People,” the conference cohosted by FLPC, USDA, and MASSDEP in June 2016, which brought together 350+ advocates, food entrepreneurs, students, and more to discuss food recovery. This blog post was written by Denise Nakiyaga Babirye, a Student in 2016 Fall Semester of Harvard Law School’s Public Health Law and Policy Seminar. I originally wrote this in October, prior to the election. While President-elect Trump seems committed to the deconstruction of the Affordable Care Act and Medicaid expansion, I still believe in the importance of access to health care for all Americans, regardless of the state they live in. Image from flickr user Jobs with Justice. Currently 22 states have not participated in Medicaid expansion. The article The Ryan White HIV/AIDS Program in the Age of Health Care Reform applauds the ACA for expansion of Medicaid that has allowed thousands of people living with HIV/AIDS to access healthcare. However, the article also notes the effects of the refusal by the 22 states to expand Medicaid. The resistance of these states, most of which are in the South, has limited the ability of their vulnerable populations to access improved and quality health care. The reasons for their defiance should be weighed against the cost that is paid by their citizens when these 22 states opt out. Another article we read for class, Why States Should Not Expand Medicaid, provides twelve reasons for the state’s defiance. The authors argue that instead of improving healthcare, Medicaid will devour the states’ budgets due to the high costs, increase dependency, and harm the economy. All their arguments fail to convince me that Medicaid expansion should not happen. Why have the states refused to learn from those that have expanded their Medicaid? There are a number of lessons to learn from Massachusetts, which was the first state that mandated health insurance for all residents. It now has the lowest number of uninsured population with the highest level of access to quality care. Not that this is a perfect example, but this should lure some states to expand their Medicaid. With the expansion of Medicaid, states get additional funds from the federal government to extend health care to their low-income population and increase the number of people who receive care. Despite the increase in federal control, I find no other reason that should keep these states away from the expansion. Medicaid expansion will help to harmonize the gap between the poor in the states and among states. It goes without saying that the poor are the most likely to be sick or get sick; therefore, ignoring this population is double jeopardy. Image from flickr user United Workers. 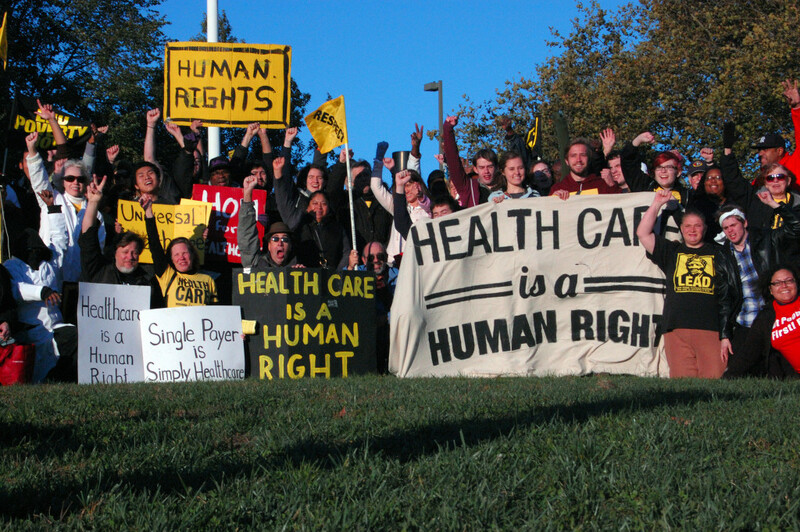 Health care should be rebranded from being a commodity to a human right. The community at large ought to be concerned about equal provision of healthcare for all and if takes Medicaid expansion that will bring this to life, every state should embrace it. Watch a recording of the November 30, 2016 event, “Transforming Our Food System.” The panel discussion featured panelists Mark Bittman, Union of Concerned Scientists Fellow and former food columnist for the New York Times; Ricardo Salvador, Union of Concerned Scientists Food and Environment Program Director; and FLPC’s own Emily Broad Leib, Assistant Clinical Professor of Law and Director of the Food Law and Policy Clinic of Harvard Law School. Kat Taylor, Co-Founder and Co-CEO of Beneficial State Bank, Director of TomKat Ranch Educational Foundation, and Member of Harvard Board of Overseers served as the moderator. Originally published by the Harvard Gazette on December 5, 2016. Written by Liz Mineo; photography by Rose Lincoln. At the same time the government urges Americans to eat healthy foods, it heavily subsidizes farmers who produce corn and other crops used in junk foods, and invests little in those who grow fruits and vegetables. The result? A pound of fresh broccoli costs about $2 in any supermarket, while a calorie- and fat-filled cheeseburger is half that price in many fast-food restaurants. This system that makes healthy food expensive and junk food cheap should be fixed, said a panel of experts who gathered at Harvard Law School on Nov. 30. 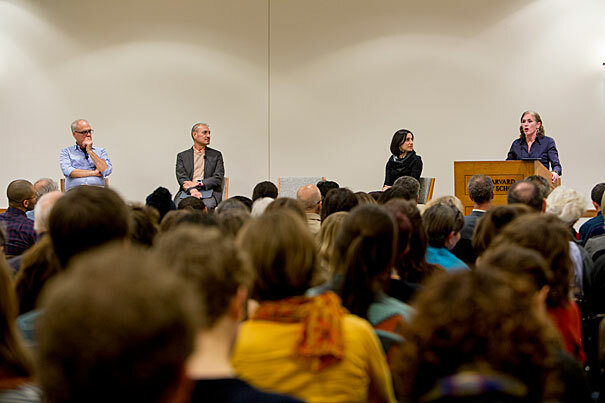 The panel discussion — “Transforming Our Food System” — was sponsored by the Harvard Law School Food Law and Policy Clinic in partnership with the Union of Concerned Scientists. The experts said a sound food policy in the United States is central to Americans’ general well-being because food affects not just health, but also the economy and the environment. Industrial agriculture, which produces most of the food in the United States, damages the soil and the air, and is driving the rise of obesity, diabetes, hypertension, and other diet-related diseases across the nation. Bittman was joined by Ricardo Salvador, the food and environment program director for the Union of Concerned Scientists; Emily Broad Leib, assistant clinical professor of law and director of the Food Law and Policy clinic; and Kat Taylor, co-founder and co-CEO of Beneficial State Bank, director of TomKat Ranch Educational Foundation, and a member of the Harvard Board of Overseers. The food movement has made great strides over the past decade, generating greater demand for healthy foods in school lunches and organic produce in supermarkets, and the spread of local farmers’ markets across the nation. Experts point to the decline in sales of sugary breakfast cereals and soda and consumption of red meat as crucial signs of progress, and although they said that progress cannot be undone, there is still much work to do. A pound of fresh broccoli costs about $2 in any supermarket, while a calorie- and fat-filled cheeseburger is half that price in many fast-food restaurants. Another area of concern is the wages and working conditions of laborers in the food system, which is known for its low pay. A smart and just food policy should include farm workers, many of whom are undocumented immigrants, the experts said. “Those who are here without the protection of legal status, those who lack the economic power to live sustainable lives, have received disproportionately the punishing effects of a mismanaged and unjust food system,” said Taylor. It’s the right thing to do, said Salvador, because food issues are social justice issues. Watch a recording of “Transforming Our Food System”. FLPC and the Conservation Law Foundation (CLF) have released the second edition of Farm & Food Law: A Guide for Lawyers in the Legal Food Hub Network. CLF launched the Massachusetts Legal Food Hub (LFH) to respond to the lack of legal services for small-scale farmers and food entrepreneurs who participate in local and regional food systems. The LFH brings together attorneys in Massachusetts who want to provide pro bono legal assistance to farmers, food entrepreneurs, and food-justice oriented community organizations. 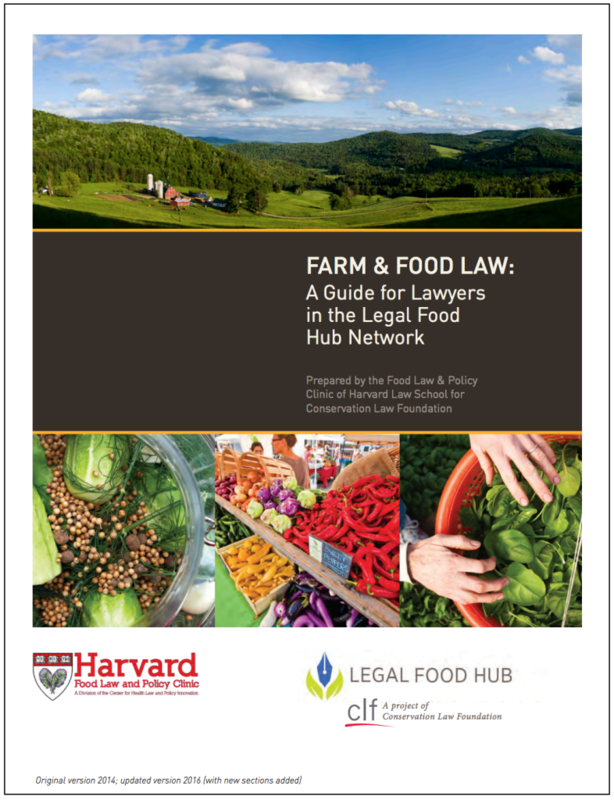 The LFH not only serves to connect attorneys to clients, but through Farm & Food Law: A Guide for Lawyers in the Legal Food Hub Network also seeks to supply resources for attorneys as they provide legal counsel to this new group of clients. The FLPC collaborated with CLF to create the first edition of Farm & Food Law: A Guide for Lawyers in the Legal Food Hub Network in 2014. Since its initial publication, the Guide has helped attorneys build successful relationships with Massachusetts small-scale farmers and food entrepreneurs—as well as other food-related businesses, non-profit organizations, and community groups—by providing a vocabulary and working knowledge of common legal issues encountered by these participants in Massachusetts’ local food economy. The Second Edition expands on the first to address a wider scope of the legal needs of small-scale farmers, including two brand new chapters on farmland acquisition and taxation. These are complex topics where access to informed attorneys could make the difference between a small-scale farm failing and thriving. This guide continues to be a work in progress and will be updated to include new chapters and respond to the needs of LFH attorneys.